Alex started his internship for Mongabay in December 2014. Alex grew up in Pennsylvania, and graduated from the University of Pittsburgh Graduate School of Public and International Affairs with a master’s degree in environmental sustainability and development planning. Alex is very committed to environmental conservation, climate and atmospheric science, and international community development. Alex currently serves as the Co-Director of USA Affairs for a Peruvian indigenous and environmental conservation non-profit organization called Ayniglobal. Alex has also been employed by the U.S. Department of Commerce doing work in environmental economics. In addition to his dedication to indigenous and ecosystem protection in the Andes and Amazon of Peru, he has extensive field work experience performing Asian elephant conservation and rehabilitation in Thailand, wildlife reserve management, field research, and data analysis in South Africa, mountain gorilla conservation research and habituation in Uganda, and sea turtle research/data analysis and marine restoration in Kenya. Alex lives in Washington D.C. with his wife Marybeth, his black and white female tuxedo cat, Winnie, and a baby Himalayan rabbit named Lilah. 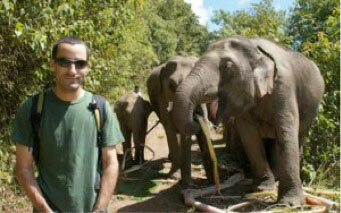 Alex’s twin brother, Victor, also a Mongabay contributor, lives in the DC area as well. Alex and his wife love to travel the world and always engage in volunteer work on their trips. Alex also enjoys mountain climbing, camping, swimming, yoga, running, biking, reading, and eating healthy.